Just say what you want to watch from compatible apps and control your TV hands-free with Chromecast and Google Home working seamlessly together.² (Google Home required and sold separately). All together now Watch movies, shows, live TV, YouTube, and photos streaming on your TV from all your family's devices.¹ Stream from your phone to TV Plug Chromecast into the HDMI port on your TV to power and stream your favorite entertainment right from your phone with just a tap. Watch shows, listen to playlists, and more. And while streaming, you can still use your phone as you normally do. Works with the streaming apps you know and love Enjoy TV shows, movies, videos, songs, games, sports and more from over 2000 apps like Netflix, YouTube, YouTube TV, and HBO NOW. 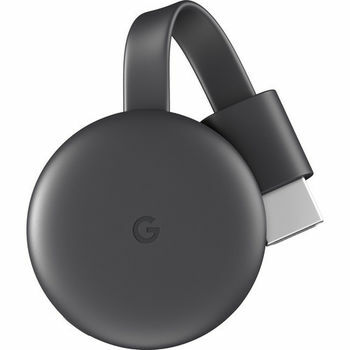 Find more at g.co/chromecast/¹ Start streaming with just your voice Just say what you want to watch from compatible apps and control your TV hands-free with Chromecast and Google Home working seamlessly together.² (Google Home required and sold separately). “Ok Google, play Stranger Things from Netflix on my living room TV.” ¹ Upgrade your TV for less Expand your home entertainment without buying a new TV. It's so affordable you can get one for every TV in the house. High-speed wireless connectivity Built-in 802.11ac Wi-Fi connects to the Internet through your wireless home network (wireless router required and sold separately). Compatible with your existing HDTV Easily connects to high-definition televisions with HDMI connectivity. ¹ Subscriptions are required to view some content. ² Google Home, Chromecast, and compatible content required to cast to a TV using Google Home. Web-based services and content require high-speed Internet service. Some services may require a subscription.